If you are thinking of a heavy piece of equipment within your budget here comes the solution. 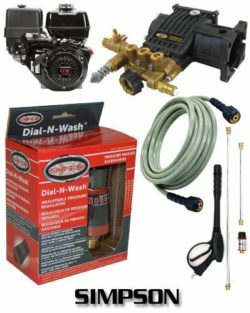 SIMPSON PS3228-S 3300 PSI 2.5 GPM Gas Pressure Washer is a perfect device to keep your house, car, driveway, fence and many more things clean. The extreme power of its engine does not let you down in your cleaning business. It’s a gas powered pressure washer to give you relief from the tension of all electric components. With world famous Honda engine it is going to provide you a massive water pressure of 3300 PSI along with 2.5 GPM of water flow. The pump is characterized by PowerBoost technology that is developed by AAA and it delivers much higher pressure at the nozzle. The device produces less noise than the other pressure washers available in the market. The shape of the machine and the 10-inch pneumatic tire helps you to carry the machine without any obstacle to your desired place. SIMPSON PS3228-S 3300 PSI 2.5 GPM Gas Pressure Washer has a Honda GX2000 OHV commercial engine that has oil alert system. They designed the pump of the machine with ceramic coated pistons and the PowerBoost technology provides much higher pressure at the nozzle tip. The device comes with a pro-style spray gun and five quickly changeable nozzle tips which are 0, 15, 25, 40 -degree and a soap applicator nozzle. There is a safety lock-out system in the spray gun and it is a professional spray gun that easily connects to the high-pressure hose. The safety lock-out system helps you out to prevent the fuel wastage. After assembling the device becomes 33.75 inches in length, 24.5 inches in height and 21 inches in width. The fuel tank has the capacity to contain 0.825 gallons of gasoline. It has an accumulated weight of 85 pounds. The hose is kink and abrasion resistant and you can use it for years. The frame of the machine is made of welded steel and equipped with steel engine plate and solid steel axle. It has a pair of 10-inch pneumatic tires that has high durability and the device can be moved effortlessly. Powerful Engine: Honda is well known in all over the world for its good quality engines. HONDA GX200 OHV engine is durable and creates much more pressure than the other engines of its class. When you have a 3300 PSI water pressure in your hand you don’t need to worry about anything else. With this kind of water pressure and 2.5 GPM water flow, all the dirt automatically keep aside from your way. You don’t have to go anywhere else to clean your tough filth. Latest Technology Pump: The pump has a PowerBoost technology. It puts high pressure on the nozzle tip so that it directly hits the filth and cleans them quickly. The high-pressure hose easily connects to the pump and there will be no leaking when connected. AAA industrial triplex plunger pump has ceramic coated pistons and it lasts for years keeping the quality intact. Professional Spray Wand: The device has a pro-style spray gun that can easily connect to the hose and is very convenient to use. 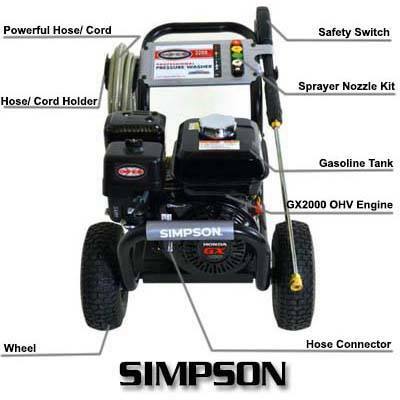 Keeping your possible requirements in mind the SIMPSON PS3228-S 3300 PSI 2.5 GPM Gas Pressure Washer provides you with five different nozzles. The 0-degree nozzle gives you output as a point to clean the corners nicely. With 15, 25 and 40-degree nozzles you can wash different surfaces according to your need. The soap nozzle helps you to apply soap to your cleaning and make the things shiny. Durability: When you are investing your money in a machine you must think about the device’s durability. Because you don’t want to buy the same thing again after few days. The company used welded steel to make the frame. There are steel engine plate and solid steel axle with the device. These materials and the Simpson Company certify the device’s durability. Warranty: The manufacturer provides you a limited warranty of 3 years on Honda GX engine. They also provide warranty of 5 years on AAA pump, 10 years on frame components and 90 days on spray accessories. So you don’t need to worry about the device’s manufacturing defects. Click to Buy on Amazon, Now! Some users have observed that sometime the high pressure relief valve fails or doesn’t work properly. It takes around 3-4 days to get the replacement of high pressure relief valve from amazon or the company. Some users complained that there is a smell of gas on their first using. It might happen because the company always checks the product before sending it to the user. If you think of putting your money to best use SIMPSON PS3228-S 3300 PSI 2.5 GPM Gas Pressure Washer can be your one of the best options. The power and pressure of water you will get will be more than enough for your cleaning job. The machine will stay with you for a long time and serve you faithfully. Different nozzles will satisfy your different needs and you will feel comfortable in using the pro-style spray gun. Altogether, among many pressure washers available in the market, it can be your best investment.